Oliver Stone hasn’t been on his game in quite some time, so it makes sense that he would start retreading old ground with his next film. And being the timely director that he is, he has chosen to revisit Wall Street over films like JFK or Platoon. The odd thing about the production of the flick is that shots that are meant to portray London are actually being shot just blocks away from the real Wall Street. And apparently, they even include Donald Trump! 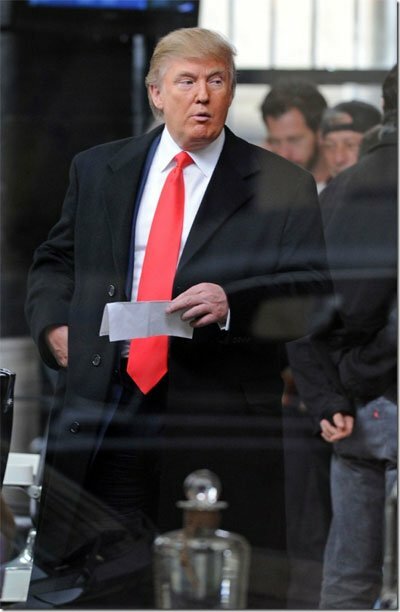 FilmGecko has gotten their hands on some set stills from the filming of the unfortunately titled Wall Street 2: Money Never Sleeps, and they include what looks to be a cameo from old toupee himself, Donald Trump. Michael Douglas will reprise his role as Gordon Gekko and Shia LeBouf will also join the ride as Jacob Moore, a young stockbroker who teams up with Gekko to warn the world of a financial crisis. Check out one of the stills below and click through to view the rest!